A color wheel or color circle is an abstract illustrative organization of color hues around a circle that shows relationships between primary colors, secondary colors, complementary colors, etc. Some sources use the terms color wheel and color circle interchangeably; however, one term or the other may be more prevalent in certain fields or certain versions as mentioned above. For instance, some reserve the term color wheel for mechanical rotating devices, such as color tops or filter wheels. Others classify various color wheels as color disc, color chart, and color scale varieties. As an illustrative model, artists typically use red, yellow, and blue primaries (RYB color model) arranged at three equally spaced points around their color wheel. Printers and others who use modern subtractive color methods and terminology use magenta, yellow, and cyan as subtractive primaries. Intermediate and interior points of color wheels and circles represent color mixtures. In a paint or subtractive color wheel, the "center of gravity" is usually (but not always) black, representing all colors of light being absorbed; in a color circle, on the other hand, the center is white or gray, indicating a mixture of different wavelengths of light (all wavelengths, or two complementary colors, for example). The arrangement of colors around the color circle is often considered to be in correspondence with the wavelengths of light, as opposed to hues, in accord with the original color circle of Isaac Newton. Modern color circles include the purples, however, between red and violet. Color scientists and psychologists often use the additive primaries, red, green and blue; and often refer to their arrangement around a circle as a color circle as opposed to a color wheel. 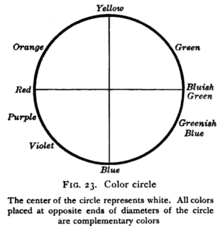 A 1908 color wheel with red, green, and violet "plus colors" and magenta, yellow, and cyan blue "minus colors"
A typical artists' paint or pigment color wheel includes the blue, red, and yellow primary colors. The corresponding secondary colors are green, orange, and violet. The tertiary colors are red–orange, red–violet, yellow–orange, yellow–green, blue–violet and blue–green. A color wheel based on RGB (red, green, blue) or RGV (red, green, violet) additive primaries has cyan, magenta, and yellow secondaries (cyan was previously known as cyan blue). Alternatively, the same arrangement of colors around a circle can be described as based on cyan, magenta, and yellow subtractive primaries, with red, green, and blue (or violet) being secondaries. Most color wheels are based on three primary colors, three secondary colors, and the six intermediates formed by mixing a primary with a secondary, known as tertiary colors, for a total of 12 main divisions; some add more intermediates, for 24 named colors. Other color wheels, however, are based on the four opponent colors, and may have four or eight main colors. 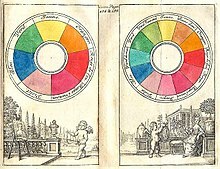 Goethe's Theory of Colours provided the first systematic study of the physiological effects of color (1810). His observations on the effect of opposed colors led him to a symmetric arrangement of his color wheel, "for the colours diametrically opposed to each other… are those that reciprocally evoke each other in the eye." (Goethe, Theory of Colours, 1810 ). In this, he anticipated Ewald Hering's opponent color theory (1872). A color circle based on spectral wavelengths appears with red at one end of the spectrum and violet at the other. A wedge-shaped gap represents colors that have no unique spectral frequency. These extra-spectral colors, the purples, form from additive mixture of colors from the ends of the spectrum. In normal human vision, wavelengths of between about 400 nm and 700 nm are represented by this incomplete circle, with the longer wavelengths equating to the red end of the spectrum. Complements are located directly opposite each other on this wheel. These complements are not identical to those in pigment mixing (such as are used in paint), but when lights are additively mixed in the correct proportions appear as a neutral grey or white. The color circle is used for, among other purposes, illustrating additive color mixture. Combining two colored lights from different parts of the spectrum may produce a third color that appears like a light from another part of the spectrum, even though dissimilar wavelengths are involved. This type of color matching is known as metameric matching. Thus a combination of green and red light might produce a color close to yellow in apparent hue. The newly formed color lies between the two original colors on the color circle, but they are usually represented as being joined by a straight line on the circle, the location of the new color closer to the (white) centre of the circle indicating that the resulting hue is less saturated (i.e., paler) than either of the two source colors. The combination of any two colors in this way are always less saturated than the two pure spectral colors individually. Objects may be viewed under a variety of different lighting conditions. The human visual system is able to adapt to these differences by chromatic adaptation. This aspect of the visual system is relatively easy to mislead, and optical illusions relating to color are therefore a common phenomenon. The color circle is a useful tool for examining these illusions. Arranging spectral colors in a circle to predict admixture of light stems from work by Sir Isaac Newton. The psychophysical theory behind the color circle dates to the early color triangle of Thomas Young, whose work was later extended by James Clerk Maxwell and Hermann von Helmholtz. Young postulated that the eye contains receptors that respond to three different primary sensations, or spectra of light. As Maxwell showed, all hues, but not all colors, can be created from three primary colors such as red, green, and blue, if they are mixed in the right proportions. The Young–Helmholtz theory is still usually seen as the most effective in modeling human color vision, though the color vision system is far more complex than differences in the retina alone, with different cells in the lateral geniculate nucleus also responding in opponent fashion to complementary colors, and further color coding occurs in the visual cortex. A mnemonic for Newton's seven spectral colors is "Roy G. Biv" [Red, Orange, Yellow, Green, Blue, Indigo, Violet]. There is no straight-line relationship between colors mixed in pigment, which vary from medium to medium. With a psychophysical color circle, however, the resulting hue of any mixture of two colored light sources can be determined simply by the relative brightness and wavelength of the two lights. A similar calculation cannot be performed with two paints. 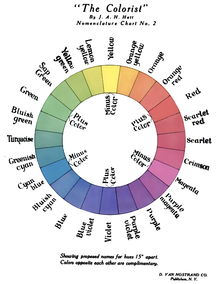 As such, a painter's color wheel is indicative rather than predictive, being used to compare existing colors rather than calculate exact colors of mixtures. Because of differences relating to the medium, different color wheels can be created according to the type of paint or other medium used, and many artists make their own individual color wheels. These often contain only blocks of color rather than the gradation between tones that is characteristic of the color circle. Color schemes are logical combinations of colors on the color wheel. In color theory, a color scheme is the choice of colors used in design for a range of media. For example, the use of a white background with black text is an example of a common default color scheme in web design. Color schemes are used to create style and appeal. Colors that create an aesthetic feeling together commonly appear together in color schemes. A basic color scheme uses two colors that look appealing together. More advanced color schemes involve several colors in combination, usually based around a single color—for example, text with such colors as red, yellow, orange and light blue arranged together on a black background in a magazine article. Color schemes can also contain different shades of a single color; for example, a color scheme that mixes different shades of green, ranging from very light (almost white) to very dark. ↑ Simon Jennings (2003). Artist's Color Manual: The Complete Guide to Working With Color. Chronicle Books. ISBN 0-8118-4143-X. ↑ Faber Birren (1934). Color Dimensions: Creating New Principles of Color Harmony and a Practical Equation in Color Definition. Chicago: The Crimson Press. ISBN 1-4286-5179-9. ↑ Joseph Anthony Gillet and William James Rolfe (1881). Elements of Natural Philosophy: For the Use of Schools and Academies. New York: Potter, Ainsworth. ↑ Kathleen Lochen Staiger (2006). The Oil Painting Course You've Always Wanted: Guided Lessons for Beginners. Watson–Guptill. ISBN 0-8230-3259-0. ↑ Martha Gill (2000). Color Harmony Pastels: A Guidebook for Creating Great Color Combinations. Rockport Publishers. ISBN 1-56496-720-4. ↑ Steven K. Shevell (2003). The Science of Color. Elsevier. ISBN 0-444-51251-9. ↑ Linda Leal (1994). The Essentials of Psychology. Research & Education Assoc. ISBN 0-87891-930-9. ↑ Goethe, Johann (1810). Theory of Colours, paragraph #50. ↑ Krech, D., Crutchfield, R.S., Livson, N., Wilson, W.A. jr., Parducci, A. (1982) Elements of psychology (4th ed.). New York: Alfred A. Knopf. pp. 108-109. ↑ a b Schiffman, H.R. (1990) Sensation and perception: An integrated approach (3rd ed.). New York: John Wiley & Sons, pp. 252-253. ↑ Rodwell, J. (1987) The complete watercolour artist. London: Paul Press, pp. 94-95. This page was last edited on 16 July 2012, at 05:01.